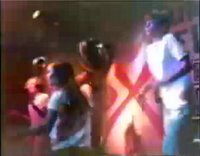 Why is a clip of a vintage Texas television dance show here? Ah patience, young Grasshopper, patience... It's here because it was shot in and broadcast from, the NorthPark Center Mall, in Dallas! Local Dallas TV station, WFAA-TV, Channel 8, had a studio that was housed inside NorthPark Mall, where they shot the daily "Sump'N Else" teen dance show, which ran in the mid to late '60s. They also produced a morning game show for housewives called "Away We Go", that was shot live from the mall as well. "Sump'N Else"? LOL! Oh, yea, they were on sump n else all right. Another planet maybe. Love the great hairdos of 1968 and the camera work is very spectacular if you can call it that. Parkdale Mall in Beaumont has an NBC TV station inside the mall. Shades of "Beat Club/Musikladen", the hot rock show broadcast on the local TV station from the mid 1960s through the mid 1980s. NorthPark is a beautiful example of 1960s architecture which remains largely unadulterated today. Even the newer Macy*s-Nordstrom wing blends in pretty darn well with the original design. Don't get me wrong -- I absolutely love this mall, and I would highly recommend anyone to visit their website and check out the pictures in the "history" section. I'm just wondering why this mall has been successfuly by *not* majorly changing its basic interior design. That's a very good question, Matt, that I don't think I can provide you with a direct answer. However, since you mention that this mall's own website has a history section, that right there is maybe a clue. The fact that the owners actually acknowledge the history of this place is pretty rare. Few other malls offer historic photos on their websites or even history. Most just like to act like they have amnesia. Another reason could be that even in the old photos this mall has a classy, elegant and classic look that seems to fit into all times and maybe that was why it was retained so well. Other mall owners simply want to remove old examples because the "modern view" of today considers such things as gaudy and not useful. I lived in Azel, Texas and would drive to Dallas just to see the BEAUTIFUL Collen Anderegg. I has never seen a prettier lady in my wholelife.